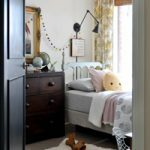 I never thought I’d be able to create another kid’s space I’d love quite so much as my daughter’s bedroom…but I may have done just that. In fact, I might even love it more! From the start I was excited about the rustic-earthy-vintage-collected-lodgey feel I was hoping to encompass in this space. I love moody and masculine schemes though it’s not a look I get to play with often so decorating this room was fun! And I’m thrilled with how everything came together. As I’ve mentioned before, Riley’s bedroom is kinda teeny – just 2.4 meters x 2.4 meters (7.8′ x 7.8′). Whilst small spaces can present a challenge, they can also offer relief in terms of decisiveness as certain factors, such as furniture configuration, are immediately dictated. As there was really only one decent position for Riley’s bed this helped determine the overall layout. I’ve spoken about most of the items in the room throughout my previous posts. 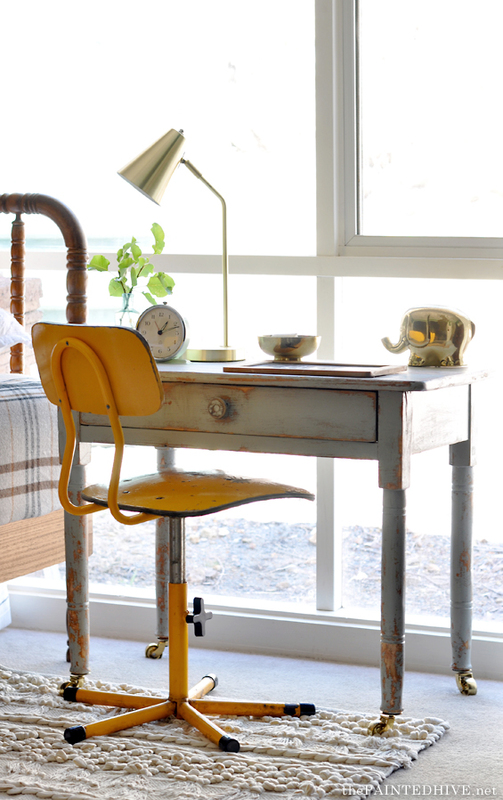 The old cotton reel bed was an antique store find. I scored it for $110 though it was missing its rails and slats so we added them. It’s my most favourite bed ever! The antique cedar dresser is also one of my favourite pieces. I may, or may not, have been squashed into the back of the wardrobe whilst taking this pic. I bought it eight years ago to act as a change table in the nursery. Since then it has been used for general storage in both my kid’s rooms. I found it on eBay for $350. With little floor space remaining, I sourced an old hall table to do double duty as both a nightstand and desk. It was $120 from an antique warehouse. 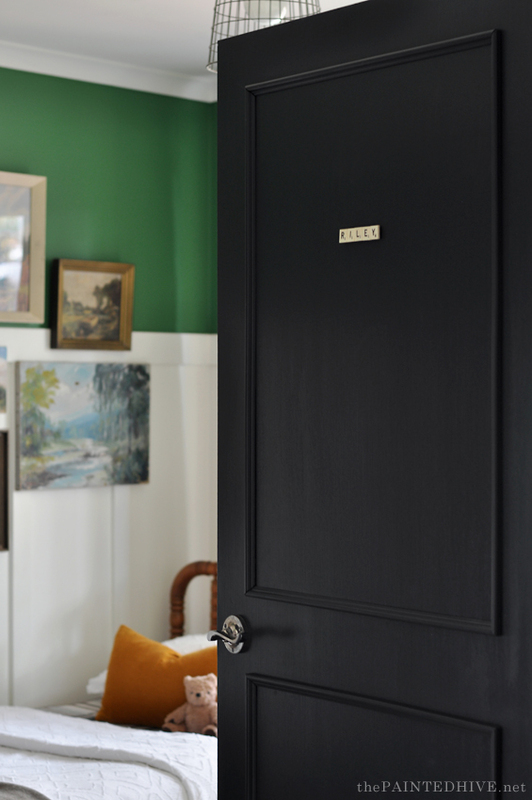 If you’ve been following along with this room makeover then you’re probably aware of the “painting debate“. After living with the desk in its natural pine state for over a year I decided to paint it this soft blue-grey to provide some relief from the brown of the bed and dresser. It’s hard to grasp the impact in these pics (as I’m shooting directly into a full size window plus it’s impossible to get all of the furniture in one frame) though I’m so glad I painted it. It adds that touch of softness and references the blues in the landscape artworks beautifully. 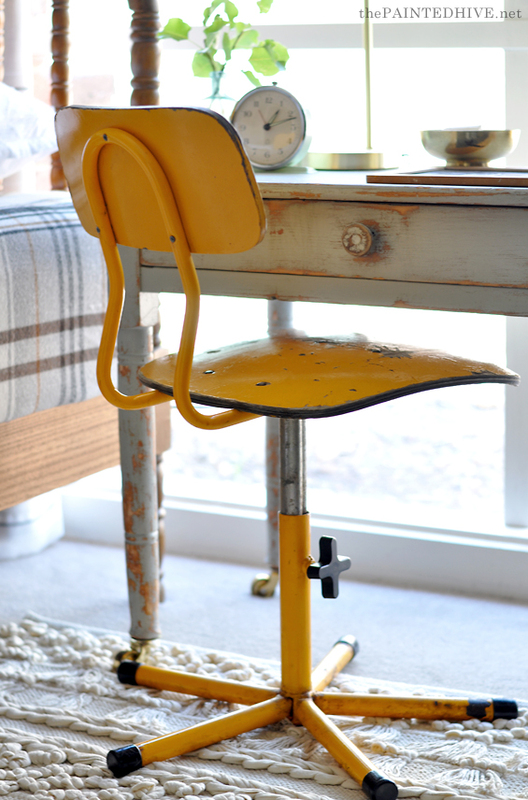 The desk is teamed with this vintage ochre swivel chair which adds a fun colour punch. It was $19 from eBay. Furniture-wise, the only other piece in the room is a basic narrow toy box at the foot of the bed. We custom built this from plywood because I couldn’t find anything the right size. I was going to dress it up like a trunk with some leather straps, brass catches and carriage handles though as it’s essentially tucked away I decided to save my energy and simply paint and dark wax it. The latest addition, and the finishing touch I was waiting on to complete the room, are the curtains. My initial idea was for something with a vertical pin stripe though just the other week I happened to come across these for $20 a panel in TK Maxx. I couldn’t say no. Horizontal stripes aren’t normally my thing, so at first I was skeptical, though now I absolutely love them! They were just standard sheers with a basic rod pocket so I added hook tape and rings and lined them with some old IKEA curtains I had to give them more bulk. Opposite the window is the built-in wardrobe. 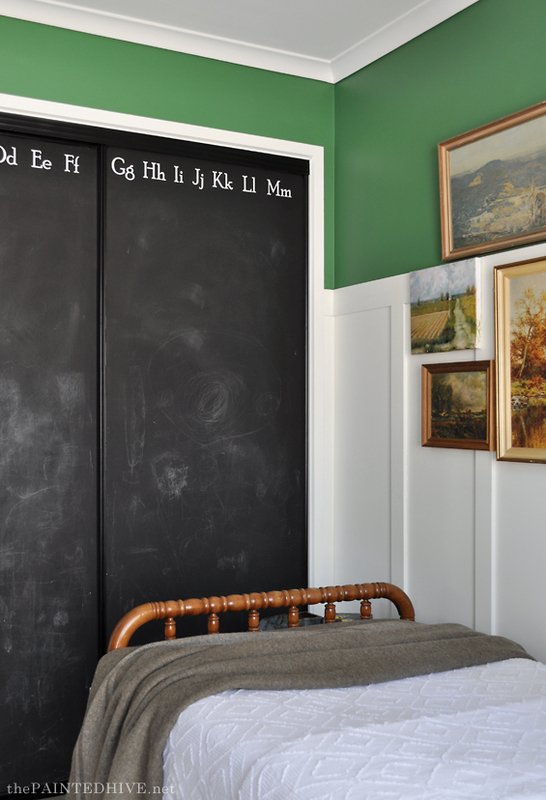 The frame and doors were originally plain beige however I painted them with chalkboard paint and added the alphabet decals when this room was being used as a nursery. 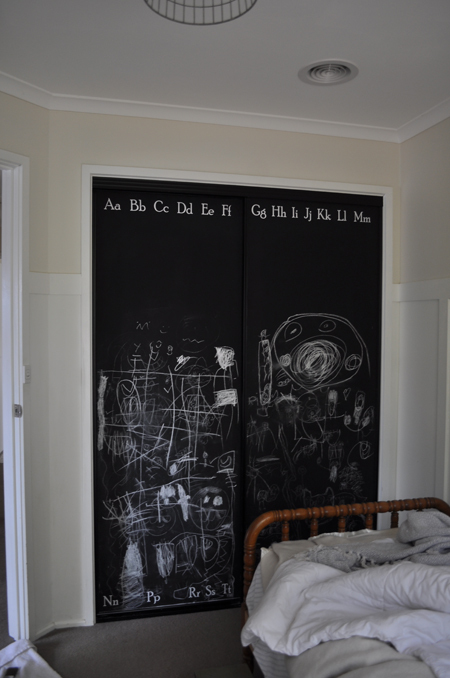 I contemplated making them over again (possibly in a barn door style) though decided it wasn’t necessary. 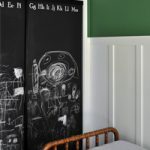 Plus the kids still use the chalkboard and I like its rustic simplicity. Amidst the decor atop the cedar dresser sits an old (slightly freaky) bath toy which belonged to my Mum, a book titled “Power Tennis” which came from Riley’s Grandpa, and a warrior horse which was a gift bought home from China. It’s always nice to include meaningful items among the purely decorative ones. 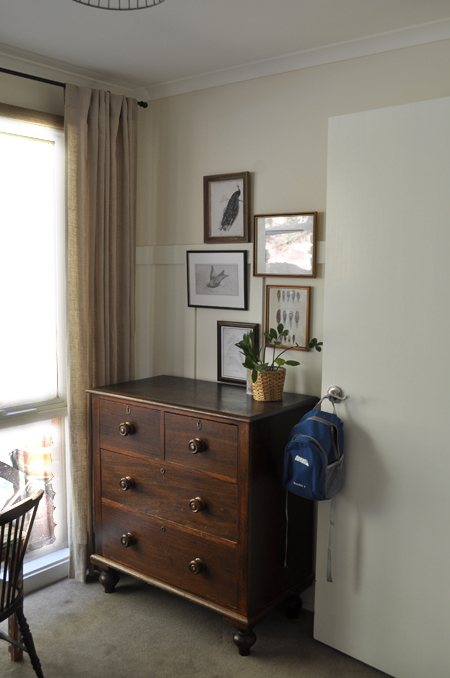 The little drawers with the brass latches are a simple IKEA hack I’ll share soon! On the desk a thrifted brass “pachyderm” bank holds Riley’s pocket money and the desk lamp, which was just $10 from Kmart, adds a touch of modernity. As mentioned earlier, as I’ve already spoken lots about this room in my previous progress posts, I didn’t go into super fine detail here. Feel free to ask if you’d like to know more about anything in particular. Love it! Everything works together so well and that green feature wall just ‘pops’! 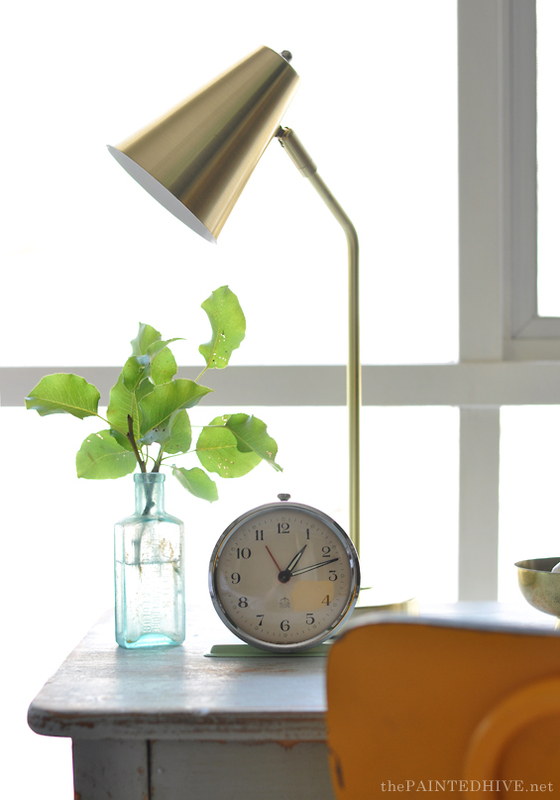 You truly have such skill in making many small knick knacks look beautifully uncluttered! Fantastic mix of colour and textures, picture gallery and even the curtain choice, you just know how to make a room look cozy and loved. Love it. Absolutely stunning! 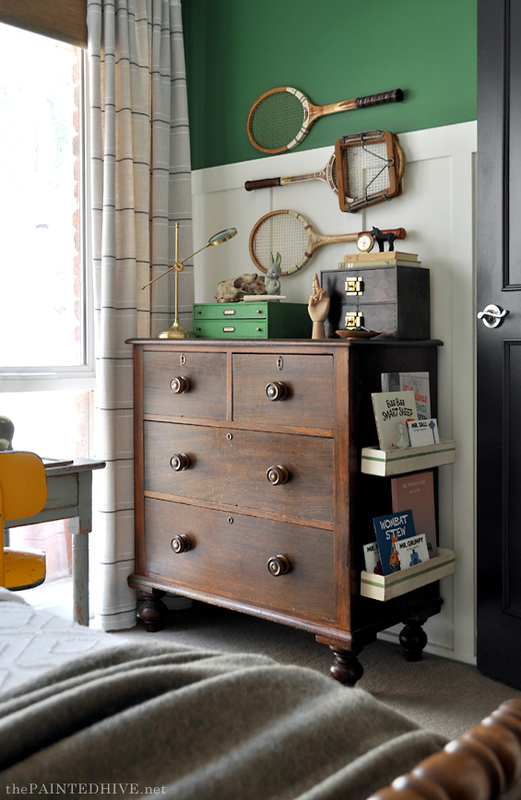 This eclectic, vintage style is exactly my style. You’ve done yet another brilliant job. Congratulations, he is one lucky boy! Kristine it’s simply stunning. 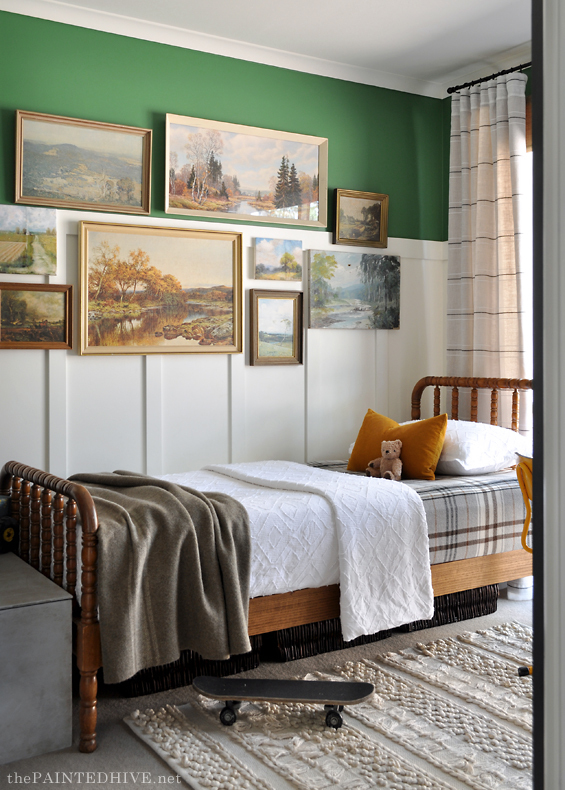 I love the green, yellow and warm neutrals. Those landscaping paintings are such a charming collection. You’ve outdone yourself! Love that room! And I’m sure he does too! Interesting take on the side of the dresser for books! It truly a neat room! I always enjoy your emails! Nice. But wondering if this is your son’s room or your room? 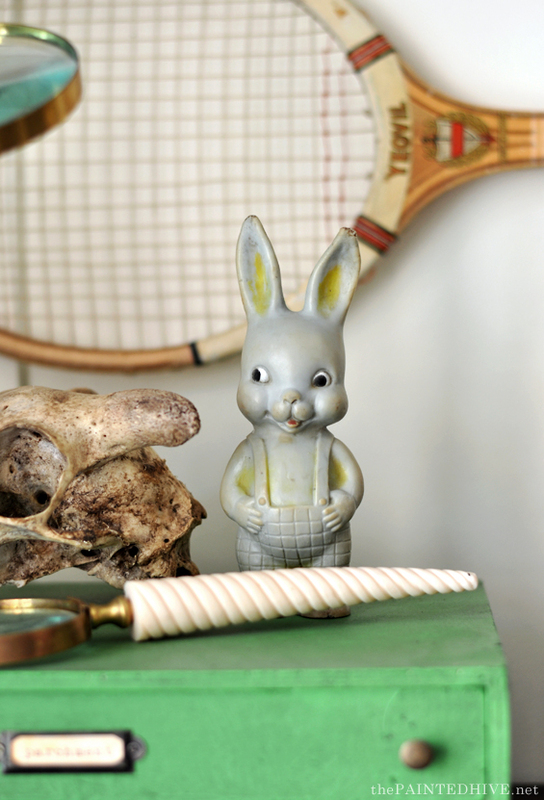 What does a little boy need with vintage rackets, or the other decorative items? You will clear it all out and tell him it’s his room and he can put anything on the walls or on his desk that he would like, yes? LOL! I remarked to my husband last night that there would be some dissenting comments like this and he said to simply reply by saying “yes, we don’t allow any fun in our house”. Ha, ha. In all seriousness though, of course this is self-indulgent on my part however if you look at the before pics that was the state of things when my son was in charge! He has only recently turned five and couldn’t care less about decorating his bedroom. I’m sure as he ages things will change however this is my house and I adore decorating so will always have a say. I was going to touch on this in the post though my brain was broken after writing the article and editing all the photos. Plus, the fact is that everyone holds different opinions and we don’t all need to agree, and I certainly don’t always have to justify my decorating decisions. Most of the decorative items have meaning or purpose: Riley plays tennis and when we found the vintage rackets he loved them. The little drawers hold his figurines and weird collections, he uses the magnifying lenses to study the “diamonds” he finds, he frequently plays with the wooden hand and we found the skull in a paddock behind our house (of course he thinks it’s totally cool). 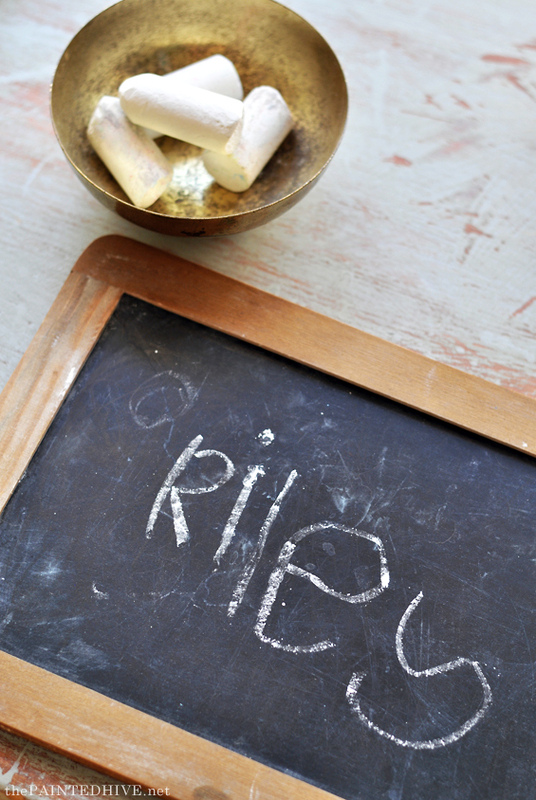 The piggy bank holds his pocket money and he uses the chalkboard often. 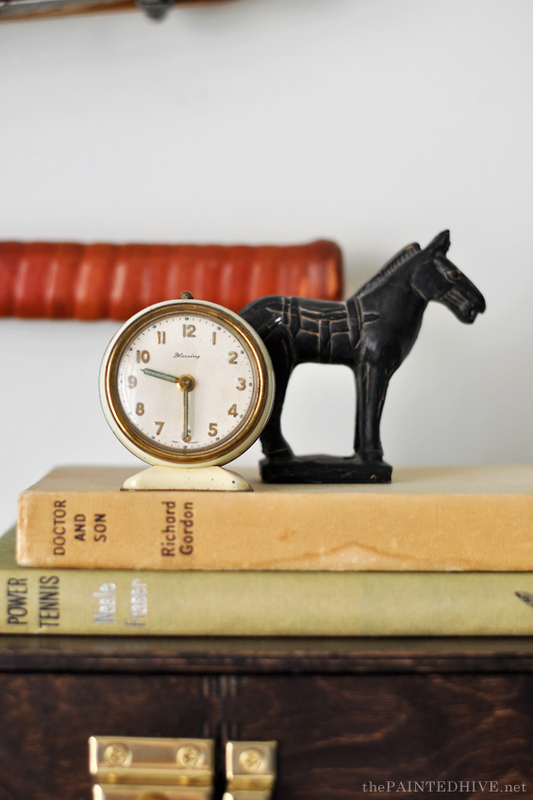 As mentioned in the post, the warrior horse, vintage books and freaky rabbit toy hold sentimental value. Riley loves his bedroom and always proudly shows it off to his friends so I’m satisfied a happy balance has been struck. I like that you said this is your home and you will always have a say. I certainly was not going to allow my children to paint each wall in their rooms a different color as one would have liked! And I also required my four chlldren to keep their rooms neat. There is no reason, IMHO, for our family home to become a pigsty. I love Riley’s bedroom and I bet he does too. As always – love it. All of it!. I really like the mix of textures, patterns with the bedding – it all works so nicely together. I love the design inspiration/theme for this room and congrats for nailing the look. 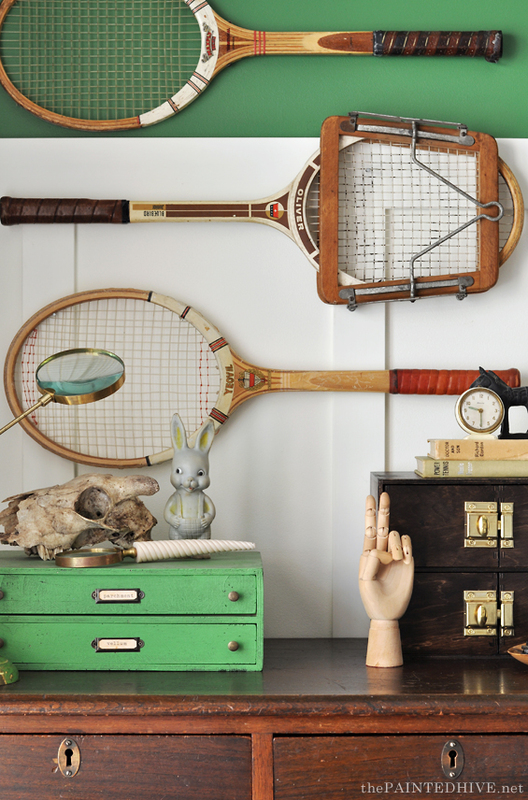 I love the green, wall paneling, art and vintage racquets, love it all! Fantastic job! I know the relief of finally calling a room complete! I know your son will enjoy this room for many years. Would you mind sharing where you got the little green set of drawers on top of the drawer? 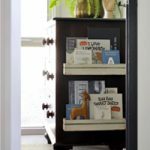 There might be some comments mentioning where to source similar drawers. This makes me regret not having children. Where did you get the rug? I just love it!! Thanks. I found it on eBay last year. They also had them on Etsy at the time though I can’t find them anymore :( If you search Google for “wedding rug” or “knotted tassel rug” you might find similar. Inspirational thank you for sharing. I just love this room…whimsical and beautiful! Great job! Fantastic job on this small space! It looks downright elegant. Beautiful! I love everything and NEED those curtains! I love your little boy’s room. 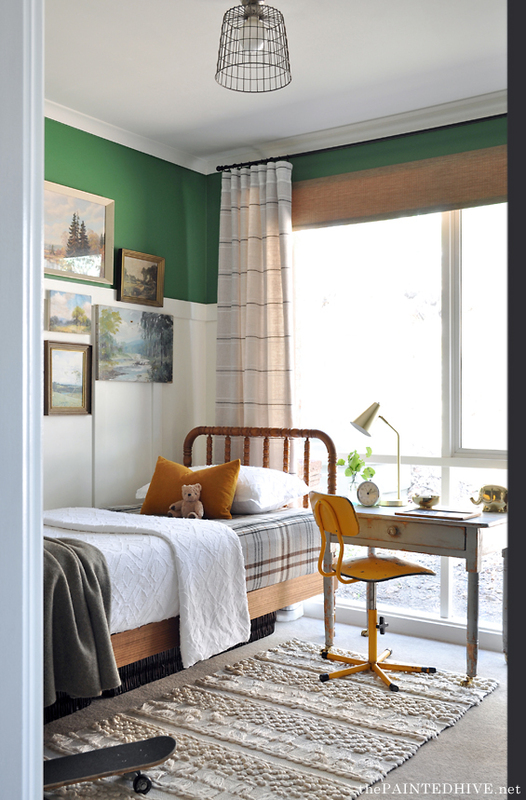 I am not a fan of dark green and will probably never use it but I love it in that space. 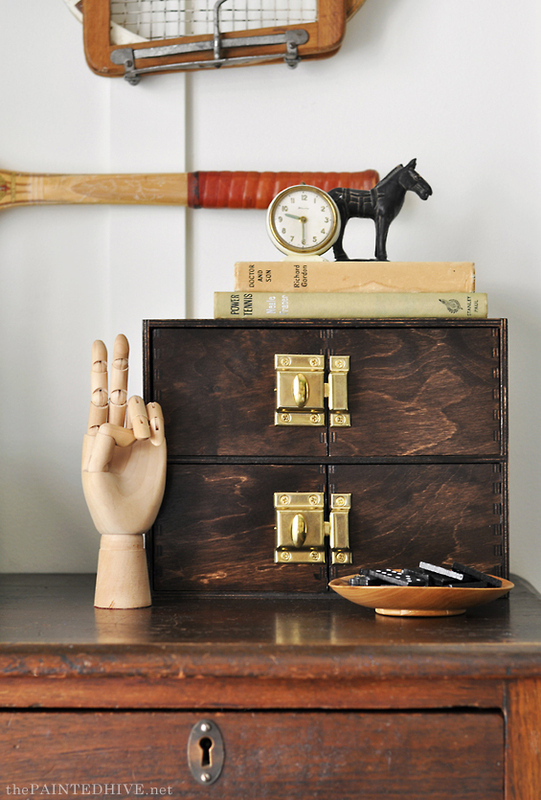 It’s the perfect complement to that antique dresser and the rackets. I also love how you will take a picture and hang it half on the wall and half on the paneling. I’ve never seen anyone do that and it’s very edgy. 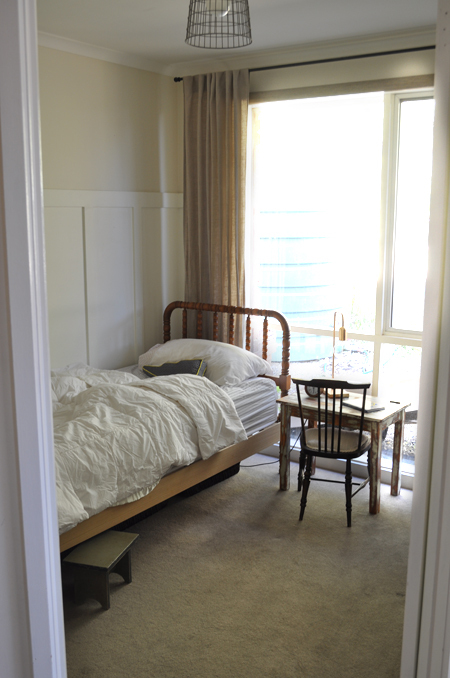 I moved furniture around in my mind because at first I did not like the head of the bed near the window. I always believed it would be too hot in the summer and too drafty in the winter, plus the light streaming in would have your boy up at the crack of dawn. But then I saw the chalkboard sliders on the other end and realized you made the right choice, coupled with the fact that Riley has great light at his desk. In studying your room, which I often do to get a sense of your thinking behind the arrangements, I realized what my home lacks. I have no meaningful artifacts. No books from my father, no knickknacks from my mother, nothing. I wish I did. The next time I visit my father I am going to ask him for one of his old favorite books and take it back home to use in my decor. Someone commented about the rackets not being for a boy’s room unless the child was interested in tennis. But I think it makes your room Timeless and one that you won’t have to change for many years because he will grow into it. In the future I see you adding a leather valise and an antique shaving mug and razor. ;-). Thanks so much Ann. Lovely thoughtful comment. Riley started playing tennis two years ago, and his father plays and grandparents used to play, so tennis is in the family which makes the rackets quite appropriate. It’s actually the whole reason I decided to use them – and Riley loves them too of course. It’s a win-win! Yes, make sure you get something from your parents! Make sure you know why they are sentimental, possible writing it down somewhere for future generations to appreciate. If it is a book, you could put a note folded up in it. My parents have both passed away, and while I ended up with a lot of their “stuff” (some of it from great great grandparents) I don’t know what the sentimental value is for a lot of it. I am trying to thin out what I do keep, and I am trying to note what I say really sentimental and what is just “stuff”. Then I will use some of Kirsten’s ideas on how to style around them. It’s so beautifully classic and timeless!!! I love this type of makeover best of all! It looks great! Cozy, cozy, cozy. Great balance of color and texture too. As for you, Miss @Tami – don’t go dissing my girl. Everyone has different ways of decorating. Some of us prefer not to babyfy kids’ rooms. 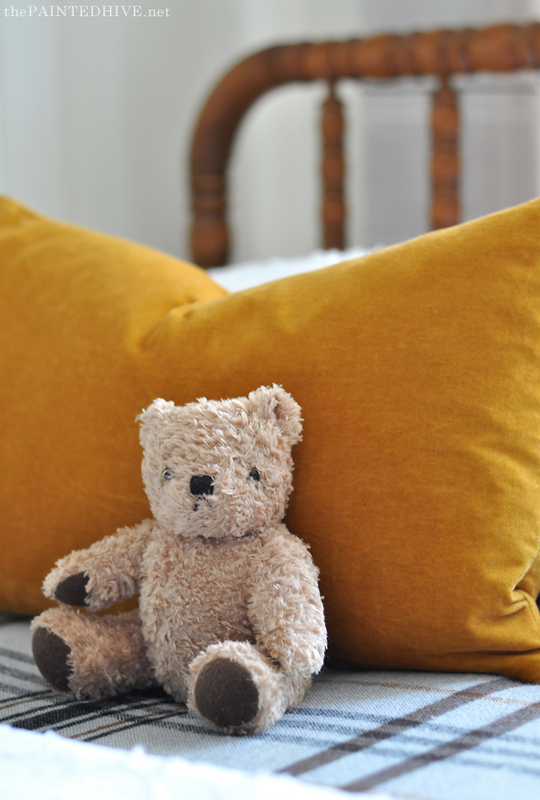 I had grown up decor in my kid’s rooms and they were perfectly happy in them – AND – they grew up appreciating nice things. You’re also missing the point of a decor blogger’s job – to showcase their work. Pictures are staged to showcase the wonderful details that went into the project. Kristin – thank you for putting yourself out there. Thanks Deb. I grew up sharing a room with my sister and my mum always decorated it to her taste in a stylish manner which suited our house. It was always lovely and I honestly don’t recall feeling a lack of ownership or belonging because I didn’t have a bright pink Care Bears quilt cover. In fact, all I can remember feeling is a sense of luckiness and pride for having such a nice room – which was envied by my friends. I’ve just been chatting with a friend about using bold colour in small rooms. I’ll certainly direct her over to this page. 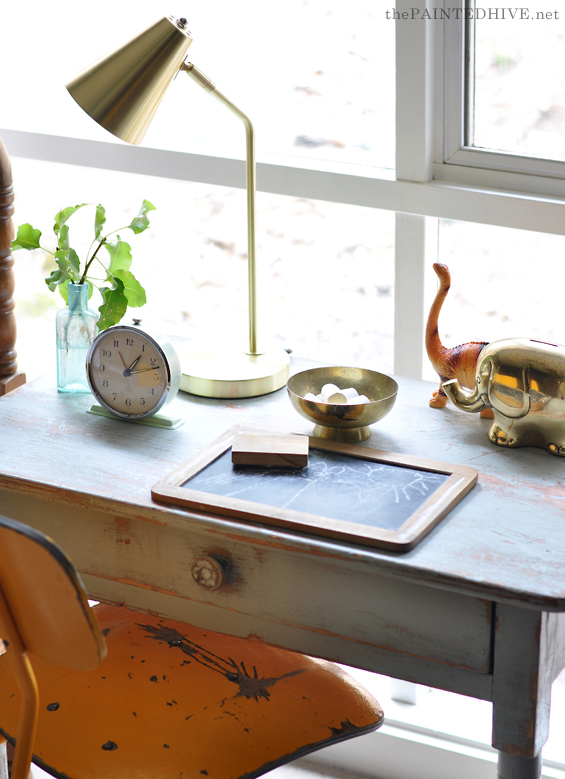 Riley’s room looks stunning and – as usual for you – very pulled together. The racquets made me smile as my mother used to play tennis four days a week when i was a child and she used to have a handful of these vintage styles from her father. Thanks Carol. Yes, Riley plays tennis and so does his Dad and so did his grandparents, which is exactly why we decided to include the rackets. And Riley really loves them. You’re right about him not being fussed about specific items at the moment. He’s only just turned five and really couldn’t care less, though he is proud of the finished space. We don’t usually comment on decor blogs but this is one adorable makeover. What a cute little boy’s room! You did a truly wonderful job of making a small room incredbily stylish, as well as utilizing the space so well! And those curtains are gorgeous! It is a beautiful, cozy room! You’ve done it again! No surprise, just the joy of the revelation! I’ve seen children’s rooms looking chaotic because of too many toys dropped around everywhere. 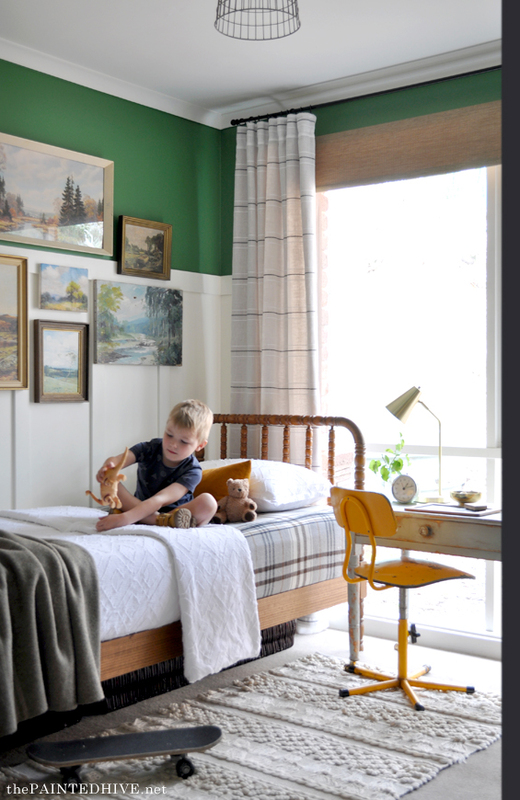 Riley’s room looks very much like a child’s room – my ideal childhood room for sure! 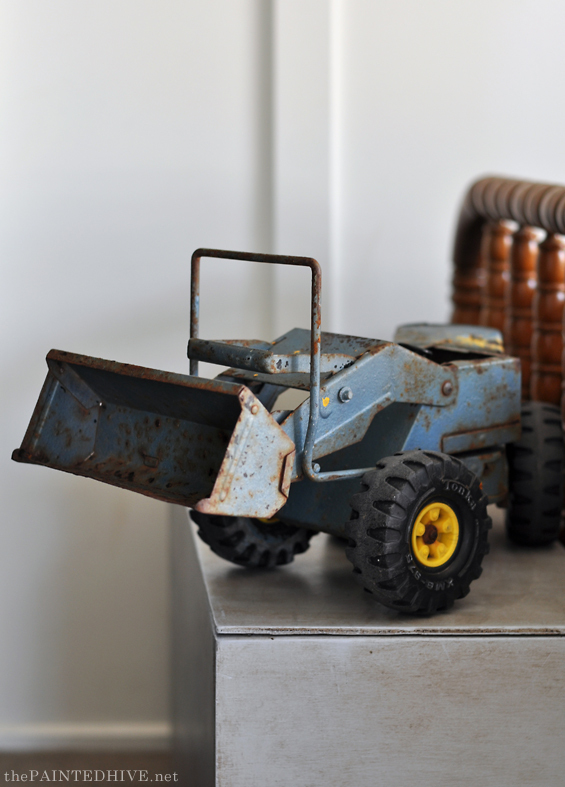 It has the toys, the elephant money box, the little shelves for story books, the black board to draw as much as he wishes – how many children have that? It has a bit of Riley’s mother’s style in it and that’s perfectly fine. There is palpable harmony and delight in the room. I just love it! Thank you again for sharing it with us! A great little boys room! 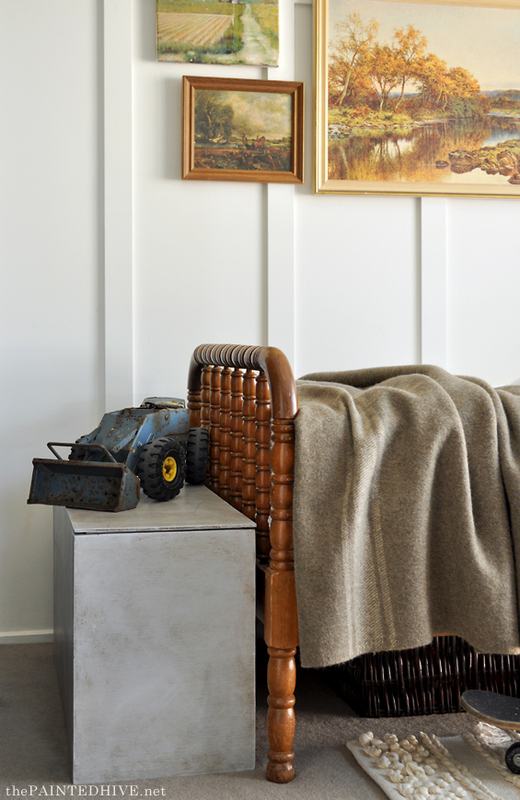 Love the collected, cottage vibes with the hints of industrial. The desk looks lovely! Good job mama on creating such a wonderful space for your son! Just…wow. It was a lovely room before and you took it to a higher level. So much warmth, texture, color and meaning. 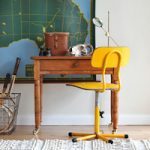 Admire your ability to find and use so many thrifted treasures! Such a beautiful room. I just love what you have done. 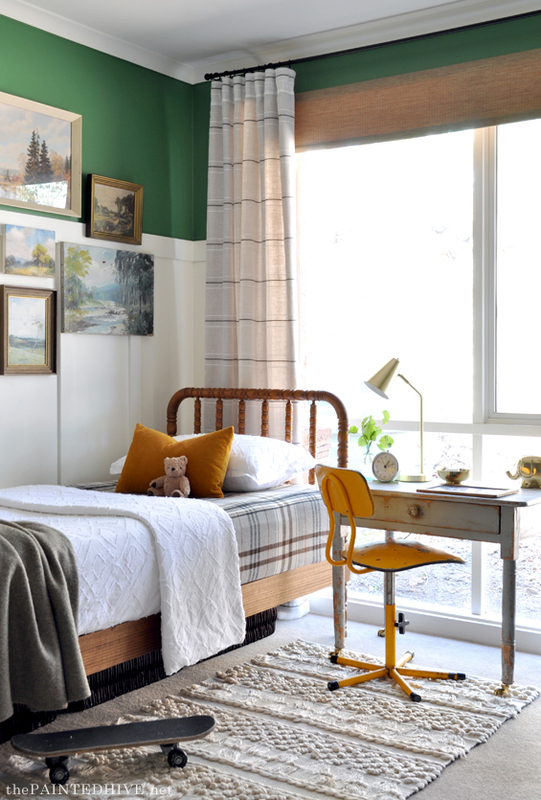 I especially like the look of bed and the painted desk. That bedspread is fantastic. Where did you find it? I literally just found where you had previously posted where it was from. Thank you for getting back to me so quickly! With the limited space, I think it turned out great. It’s a room that will still be fine when he is older. When my son was a baby my parents gift was a dresser. I picked out one that he would grow into. I love the dresser you picked out. The colors and accessories come together so nicely. I love the room. Wow! He must be so happy with his masculine room. I love that it’s not too previous for him to be a boy in. I’m sure he loves your design choices and will add his own. I totally revamped my grand-nieces’ bedrooms several years ago while they were away on holidays. Their mum gave me a few tips about colour and styles they would like. They screamed with delight when they opened the doors to their “new” rooms. Now, several years later, they have re-done their rooms on their own with their own design choices. Ignore the critics. Your boy will always his special room that his mum created with so much love. Love it. Just love it! This room is amazing! 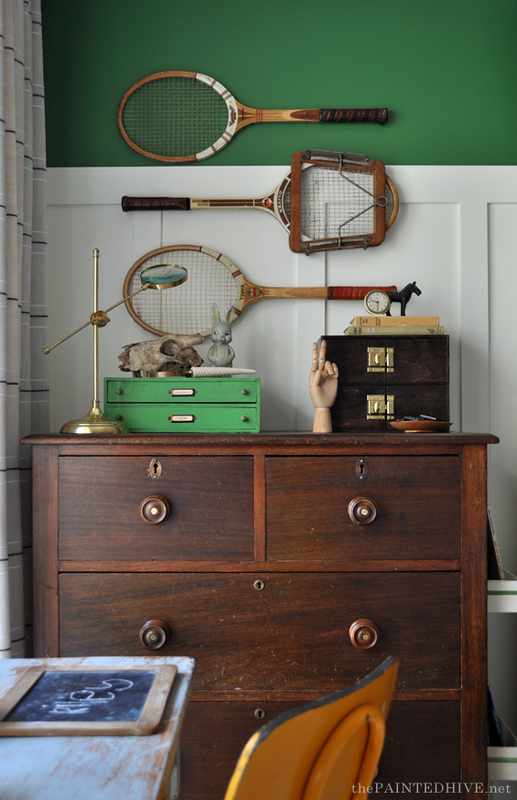 From the wall color to the vintage tennis rackets, and the diy art work, I love it all! So much inspiration. I love this room. 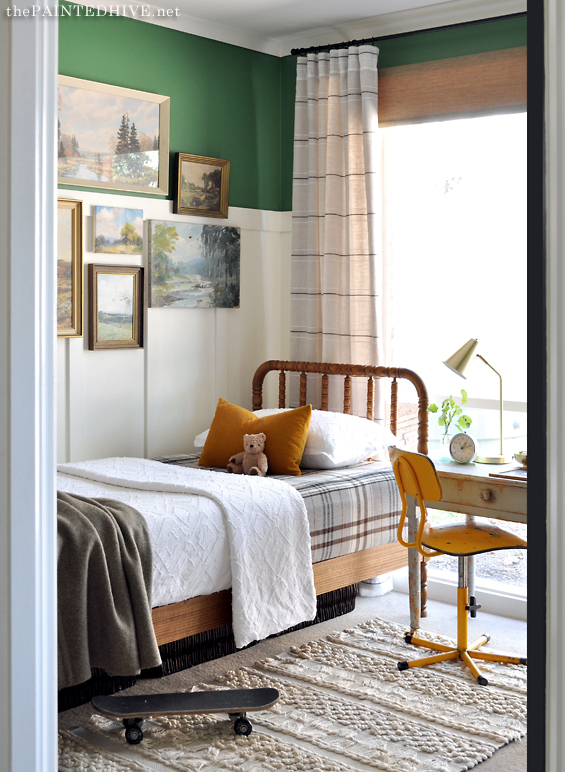 I need to repaint my younger boy’s room and would love to do a similar color scheme. Do you mind sharing the name/brand of the green paint you used on the top portion of the wall? Thank you! Sure, it’s called Tarmac Green by Dulux. I was going to ask the same thing, so thank you for sharing. 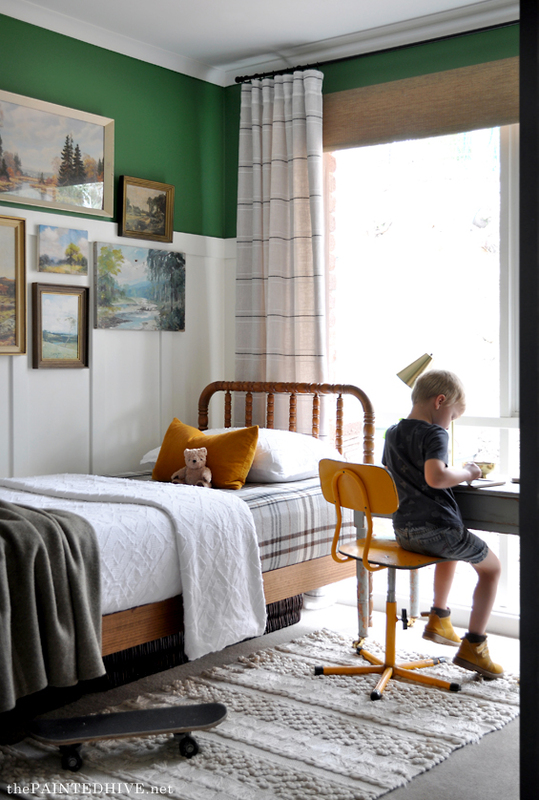 I just love everything about this room, especially the colors you’ve pulled together and the vintage pictures. You are very gifted in your sense of decor. Simply gorgeous! Second- I was wondering if you could share where cream rug can be purchased.? I’ve been looking for something like that for awhile! Thank you! Sorry it has taken me a while to reply. We’ve been away on vacation. I found the rug on eBay though the seller no longer stocks them. You might find similar if you Google “tufted boho rug” or “wedding rug”. Beautiful. Where did you find all the pictures/paintings/prints on his wall. You’ve done an amazing job. Thanks Rachel. They are just cheapies from Op Shops, Vintage Markets and Charity Stores (I don’t thank any one painting cost me more than $10). Some I made myself. 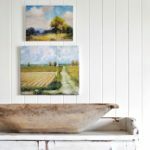 You can read more about that here: http://thepaintedhive.net/2017/10/easy-diy-vintage-style-canvas-paintings/.